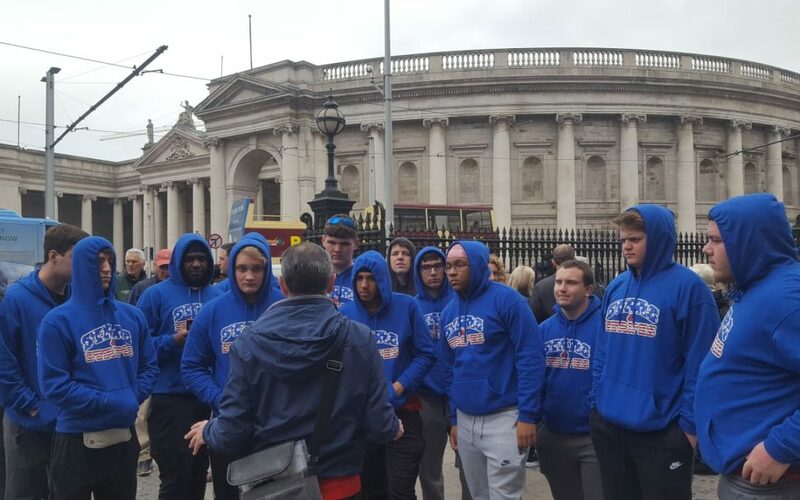 A select team of high school players known collectively as Team Stars & Stripes arrived in Dublin at the weekend to kick off the 2019 European series of spring tours, which are being organized by Global Football for a 24th consecutive year. The Texas-based organization will take NCAA D-III college football teams to Austria, China, Germany, Italy, Spain and the Czech Republic to experience new cultures and play a competitive game against local opposition. The University of Pennsylvania traveled to Beijing and Shanghai last month, as the Quakers became the first Ivy League school to play a game of American football in China. First up in Europe, Team Stars & Stripes will enjoy the sights of Ireland and then Scotland, where they will take on the East Kilbride Pirates junior team at the University of Stirling in the Global Ambassadors Bowl on Saturday, April 6, kickoff 1pm local time (8am US ET). The bowl will be contested for a 12th time having first been played in Japan in 2008 and is hosted in conjunction with the University of Stirling Clansmen, a premier division UK college team. Global Football and the East Kilbride Pirates share a rich history with Hanover College from Indiana having traveled to face the Scottish club’s senior team in 2015, followed by North Central College in 2016 and Claremont McKenna in 2017. The partnership has led to Pirates coaches venturing to the United States as part of Global Football’s International Coaching Exchange, to spend time learning from NCAA D-III programs and then using knowledge gained to benefit the development of the sport in Scotland. While in Ireland, the visiting high school players will visit St Patrick’s Cathedral, Trim Castle, the Gaelic Athletic Association Museum, Croke Park and the Guinness Storehouse. From Dublin, they will head north to visit Belfast before boarding a ferry to Scotland for walking tours of Edinburgh and Glasgow, where they will take on the Pirates. That same weekend, the University of the South will be in Rome where the Sewanee Tigers take on the Lazio Ducks of the Italian Football League. There is also Italian opposition in store a week later on May 25 when Muhlenberg College faces Guelfi Firenze in Florence, where the hosts are led by former Baylor coach Art Briles. On June 1, Luther College will meet a Spanish All Star team organized by former Barcelona Dragons national coach Marcos Guirles in the Catalan capital. June 8 sees Elmhurst College take on one of Austria’s top clubs the Graz Giants, then on June 16 North Central College plays the reigning Czech League champions, the Prague Black Panthers, who have won six straight titles.